Pamela Hamic (left), co-owner of the West Walker Motel, with Visit California Manager of China Marketing Walt Wang and business partner Chris Long at Wednesday’s Global China Ready Conference in Mammoth Lakes. Visit California asks local business owners, are you China ready? 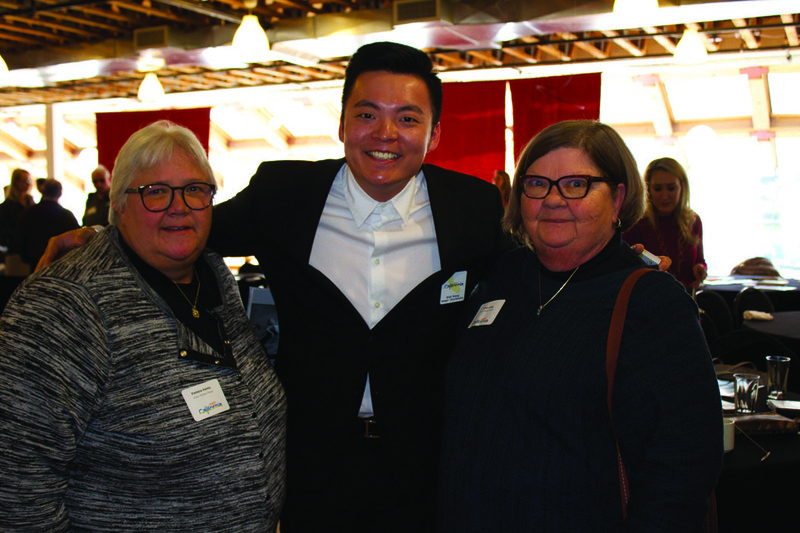 On Wednesday, March 29, Mammoth Lakes Tourism, Mono County, and the Mammoth Lakes Chamber of Commerce hosted a Visit California Global China Ready Conference in Mammoth Lakes. More than 60 Mono County business owners and residents registered for the event, which was free to Mammoth Lakes Chamber of Commerce Members and cost $30 for non-members. Mono County Supervisors Stacy Corless and John Peters were present, as were Mammoth Lakes Town Council members John Wentworth, Colin Fernie, and Cleland Hoff. In 2015, approximately 2.5 million people visited the United States from China. That same year, China surpassed Canada as the largest international spender on tourism in the United States, spending $27 billion in the U.S. Approximately 1 million of those visitors came to California. According to Mono County Economic Development Director Alicia Vennos, most Chinese tourists come to Mammoth Lakes and Mono County while traveling between coastal “gateway” cities, Yosemite National Park, and various desert destinations. Right now, most Chinese tourists are coming to the area on bus tours. However, more and more are deciding to rent cars and travel independently as families or small groups of friends. “We have to be ready to receive them, make them feel welcome,” said Vennos this week. According to Charlie Gu, Director of the company China Luxury Advisors and speaker at the conference, 87 percent of Chinese travelers are younger than 40, and 80 percent have a college degree or higher. Of that group, roughly two thirds are considered high income. There are 1.3 million millionaires in China, and many of those are interested in skiing. “Once you can afford to learn to ski, you’ve made it,” said Gu at Wednesday’s conference, adding that the ski industry is growing in part because of government directives to incorporate winter sports into the public school curriculum. Next story Whose Job is it Anyway?